I am excited about this on a couple of levels. A) it’s been something I’ve wanted to make happen for about ten years and, 2) my sister, Christine, had used this technique on another project in her house and I really wanted to use it somewhere and this turned out to be a good fit. I cannot remember the book I read when my middle child, Kendall was born, but it was a book about being intentional with why you do what your do as a family. One of the topics she touched on was coming up with a list of your family’s values or what’s important to you as a family. I dabble in being intentional, so I jotted down a few ideas on a piece of paper and thought, “I should make a collage or something artsy with this.” Well guess what, adding Kendall to our family (Natalie was three years old) rocked my world more than I anticipated and finding a normal rhythm took a while. In true Jenny-fashion. I lost the momentum for that once life-changing revelation and let the list get lost and found about 20 times before I finally threw it at my creative-genius friend, Mary Jo and said, “Here! Make me something cool with this list.” She picked up on my vision and promised to breathe it into being. She lost my list in her creative-genius of a craft room. And that is where I left my list of values project (hopefully, not my actual values). Until now! 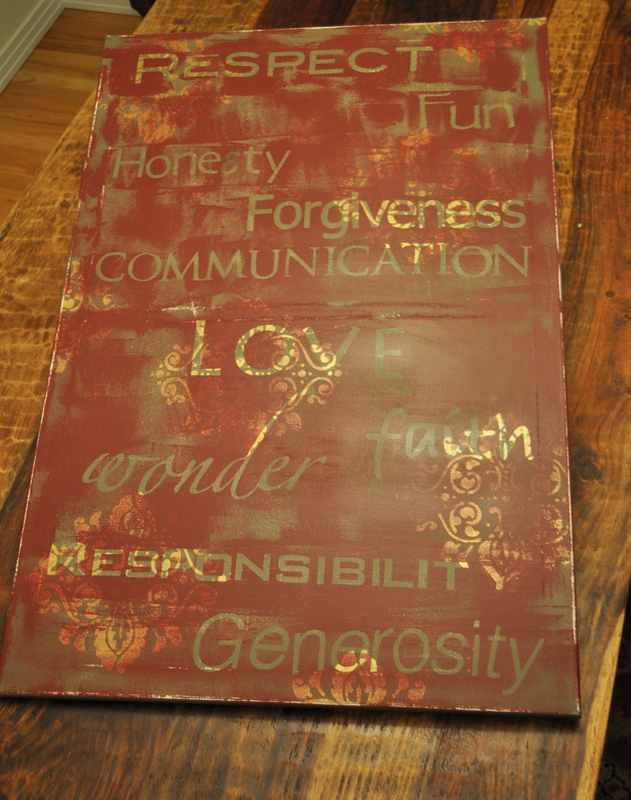 I re-created my list, added a few, was m ocked by my husband and my sister about a few, adapted said list and used Christine’s paint and canvas technique with our family’s list and, VOILA! My something artsy/family’s values project complete and installed. I am not especially creative or crafty. This was a project that had steps to follow and it was not at all complicated. Just a little messy and time-consuming, but fun! 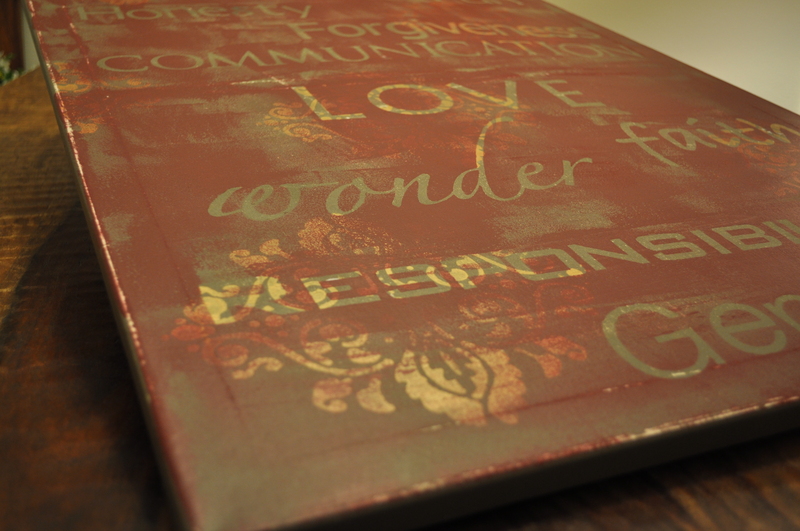 It’s a canvas, three different paint colors and words cut out of paper. I painted the whole canvas one color. It dried, I sanded it to rough it up, then I used a stencil of a fleur-de-lis pattern and loosely painted that randomly across the canvas with color number two. It dried, I sanded it to rough it up. Then, I placed the letters on with a light coating of spray adhesive onto the canvas and painted over that with color number 3. (I didn’t saturate my roller, I just got enough paint on there to cover the letters, but still let the other two paint layers show through). I let that dry and then peeled the letters off. I let all of it dry, sanded it once more and that was it! And now, to apply the values. I’ll need another ten years or more for that.